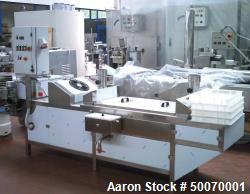 Aaron Equipment has a large inventory of reconditioned, unused, used pasteurizers and HPP High Pressure Pasteurizers . Pasteurizers are used for heat treatments to kill off the entire population of disease-producing bacteria and greatly reduce the total number of micro organisms in milk, fruit juices and liquid egg. If you are looking to sell your used pasteurizers or HPP High Pressure Pasteurizer submit a request online or contact Erik Eichert at 630-238-7480.